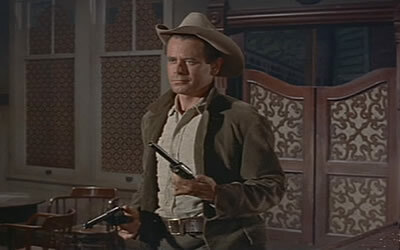 This is a late Glenn Ford variation on the old gunfighter-young gunfighter theme. 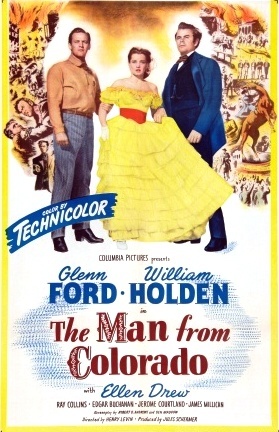 Ford is Marshal Dan Blaine, who has a nice life a small western town. He is the live-in romantic interest of Lisa Denton (Angie Dickinson), local saloon proprietress and madam. 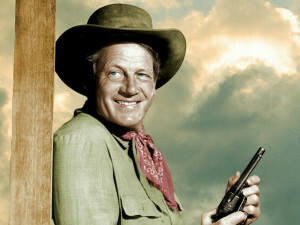 He is a former convict and has a justly earned reputation as being very good with a gun. Lot McGuire (Chad Everett) is a young man good with a gun himself, and is seeking out Blaine to test their comparative skills. He encounters Blaine fishing outside of town, and Blaine takes a liking to him, trying unsuccessfully to dissuade him from his plan. 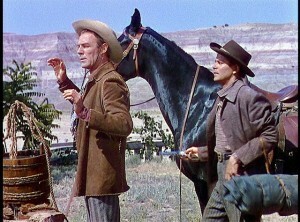 Outside of town Blaine also rescues lowlife Ernie Scarnes (Jack Elam), whom he knew in prison. 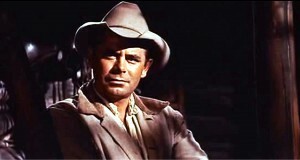 Marshal Blaine (Glenn Ford) likes young challenger Lot McGuire (Chad Everett). Scarnes plans to blackmail Lisa with knowledge of Blaine’s past, but she already knows it. 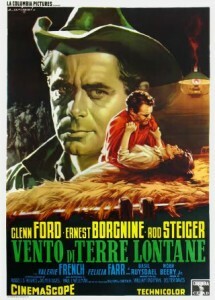 She hires Scarnes to drygulch McGuire; he kills McGuire’s horse, but McGuire gets him. Blaine finds out and ends up having to kill McGuire anyway. 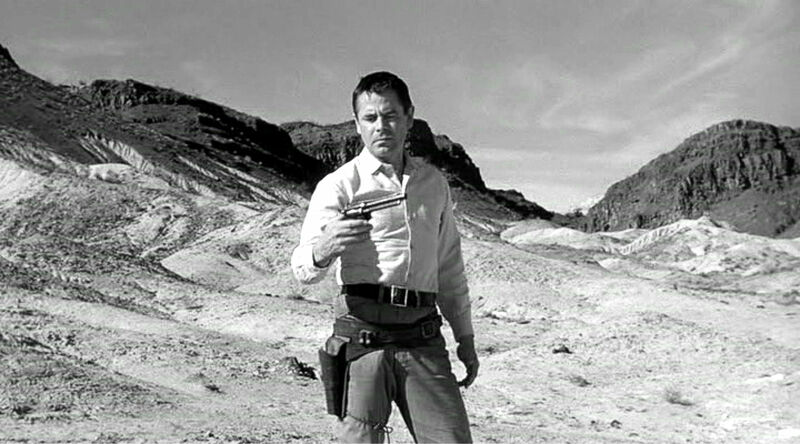 As he rides out of town and out of Lisa’s life, he tosses his own gunbelt into McGuire’s grave. 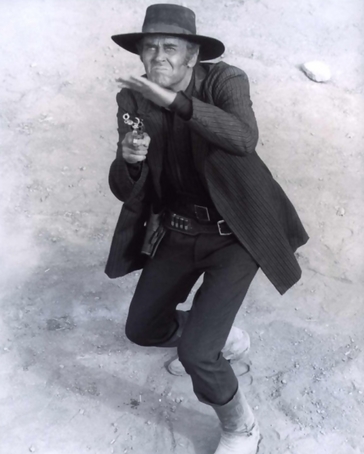 This time the old gunfighter has won, but it gives him no satisfaction. Marshal Blaine (Glenn Ford) has it out with Lisa (Angie Dickinson). 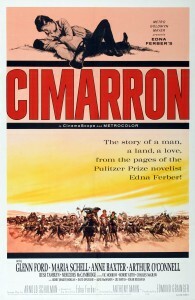 Excellent character actor Royal Dano plays Pretty Horse, a local Indian leader of indeterminate tribe. This was director Richard Thorpe’s last movie. Not really bad, but a bit unsatisfying. 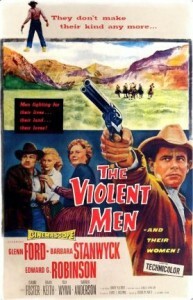 This was Glenn Ford’s twentieth western. 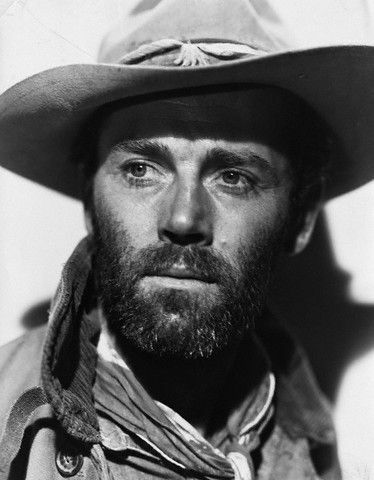 He’d been making them for 25 years (see The Desperadoes for one of his earliest efforts), and wore the same hat that he had adopted in the 1950s and wore to the end of his career if given his choice. Chad Everett was an up-and-coming young star, cast as a young gun in this and Return of the Gunfighter with Robert Taylor, before he moved into television for good. 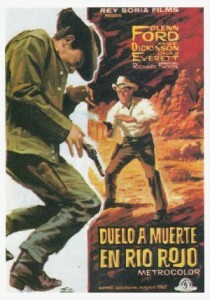 Compare the gun in the grave touch with Ford’s similar ending to The Fastest Gun Alive ten years earlier (1956), or with the end of High Noon, for that matter, in which Gary Cooper throws his badge in the dust. 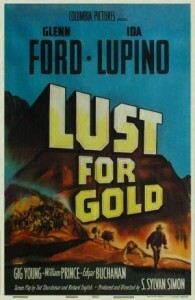 In color, at 105 minutes. 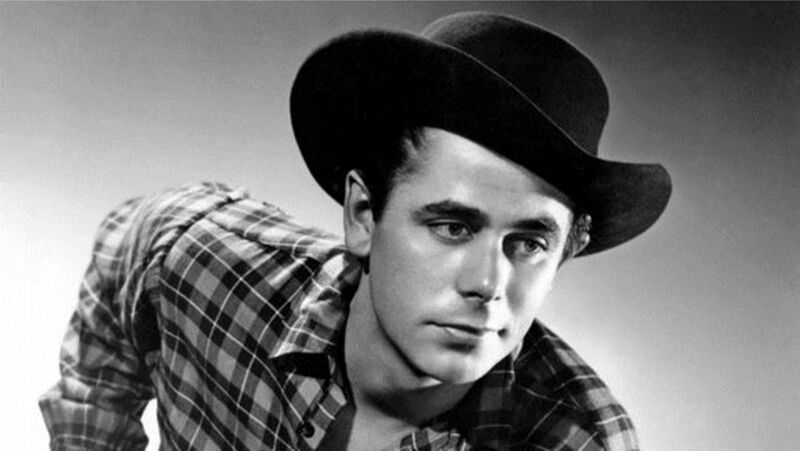 This entry was posted in Westerns Worth Watching and tagged Glenn Ford on November 28, 2014 by Nicholas Chennault. 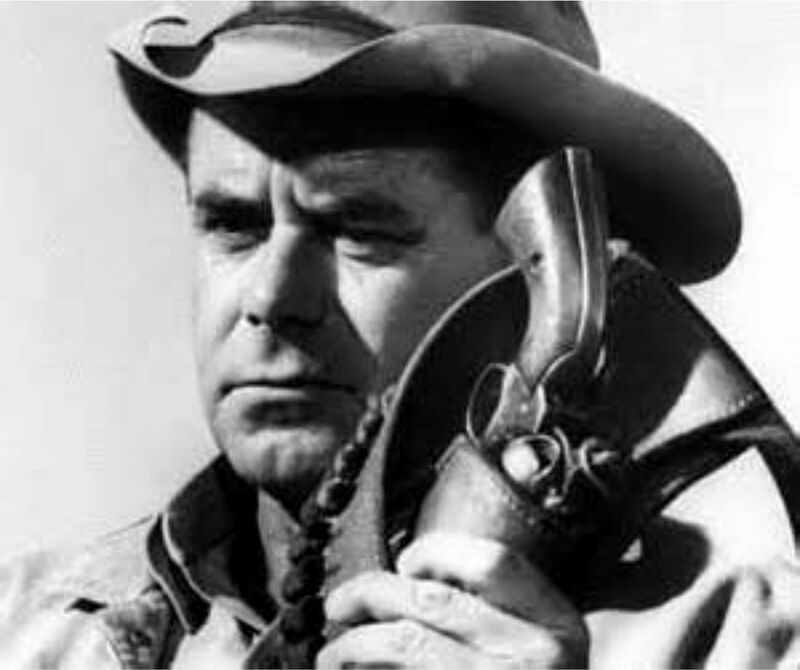 Jubal Troop (Glenn Ford) is a hard-luck cowboy whose horse dies while carrying him over Glacier Pass from Montana into Wyoming. 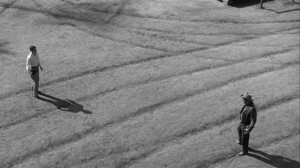 He is found unconscious by Shep Horgan, a big rancher in Jackson Hole, who offers him a job. 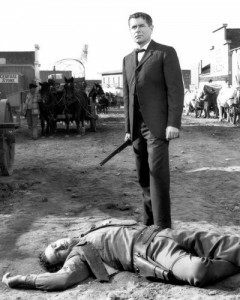 The situation is not without obvious complications: one of the resident cowhands at Horgan’s ranch, Pinky Pinkum (Rod Steiger), resents any authority and the newcomer. 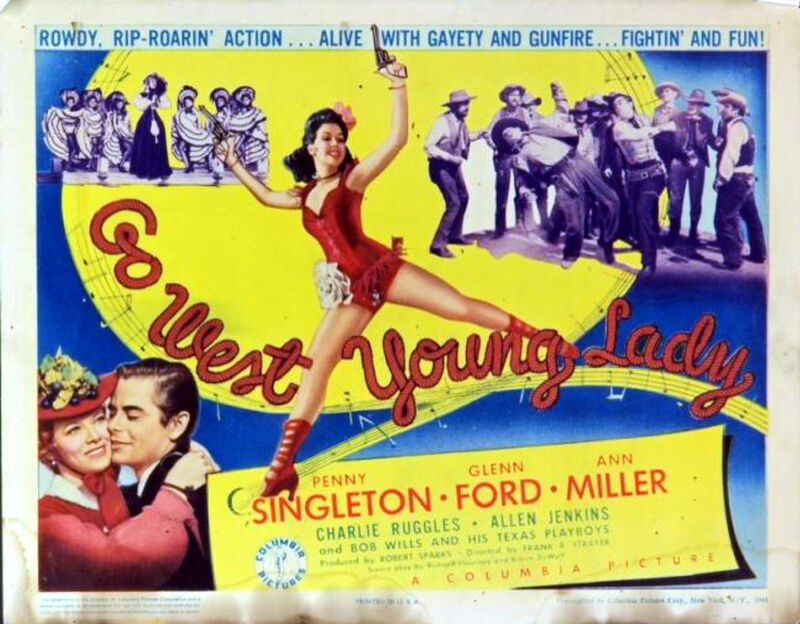 Even trickier is Mae (Valerie French), Horgan’s young wife from Calgary. They’ve been married for 16 months, and she’s unhappy. She’s previously had some kind of relationship with Pinky and now is coming on to Jubal, who’s having none of it. Glenn Ford as Jubal Troop, trying to figure things out. Horgan soon appoints Jubal his foreman, and Jubal accepts with misgivings. The prickly situation with Pinky becomes more difficult, and he has more interaction with Mae. A group of ten “rawhider” wagons on their way to Idaho camps on Horgan’s land while some of their members recuperate from illness. 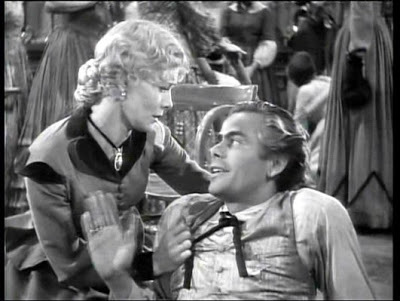 Pinky and several Bar 8 riders try to run them off, but Jubal overrules him and lets them stay, incurring the gratitude of their religious leader Shem Hoktor (Basil Ruysdael) and the admiration of his daughter Naomi (Felicia Farr). 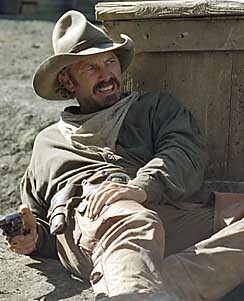 Naomi is promised to Jake, another member of the group who is jealous, and Jubal hires Reb Haislipp (Charles Bronson), a good-natured cowboy who’s been riding along with the rawhiders. Tensions on the Horgan ranch get higher with mountain lions raiding their stock and with Jubal developing a romantic interest in Naomi, which she reciprocates. While the men are camped far from the ranch house on roundup, Mae lures Jubal back to the ranch and tries to get him into bed. He doesn’t go for it and heads into town and starts drinking. 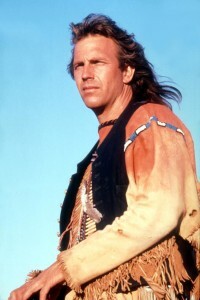 Reb goes looking for him when he doesn’t return promptly. Pinky is filling Shep’s mind with imprecations of a relationship between Mae and Jubal. When Shep gets back to the ranch, Mae lies and says it’s true. Shep bursts into the saloon and starts shooting at Jubal, who’s not armed. He doesn’t want to shoot back, but when Reb tosses him a gun he uses it in self-defense. 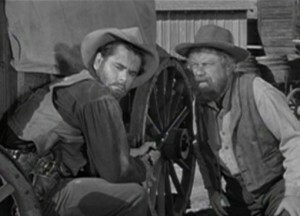 Wounded, Jubal makes it back to the rawhider wagons. 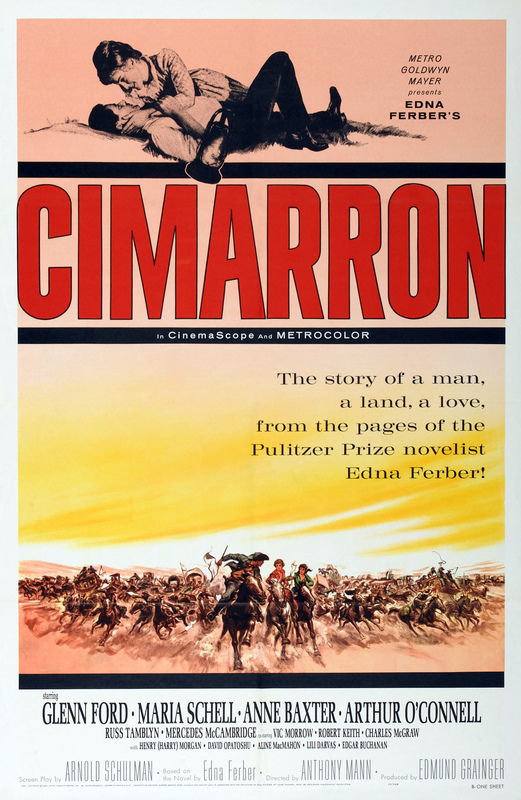 They take him in, with Shem Hoktor’s wagon heading east to hide him, and the rest heading west for Pocatello. 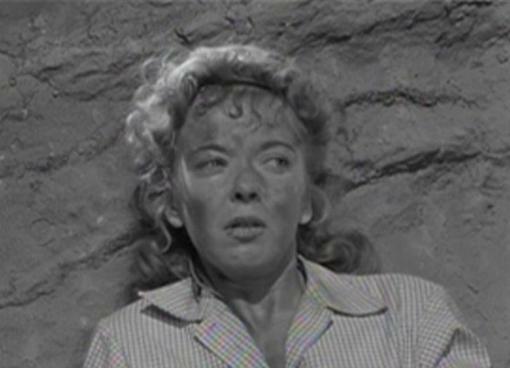 Valerie French as the faithless Mae, coming on to Jubal (Glenn Ford). Pinky arrives at the ranch after the killing and intends to renew his former relationship with Mae, who doesn’t want him now. 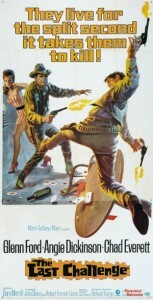 He beats her badly and recruits a posse of his Bar 8 friends to hunt down Jubal. 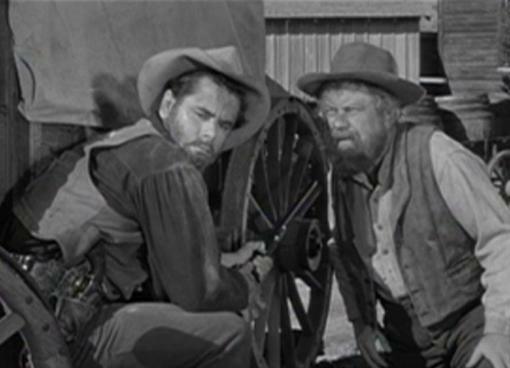 It takes a couple of days, and by the time they find Hoktor’s wagon (with the help of jealousy-crazed Jake), Jubal is heading back for the ranch so Mae can tell the posse the truth when they get to him. Mae is in bad shape when Jubal finds her, but she manages to tell the doctor the truth about her and Jubal and about who beat her before she dies. 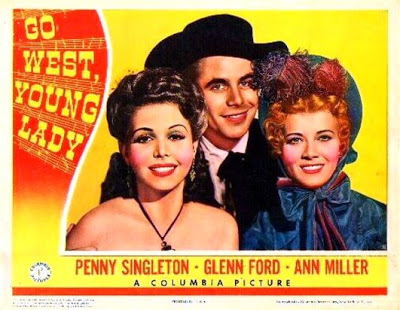 As the posse fingers their rope while looking at Pinky, Jubal and Naomi ride off into the sunset, or maybe just to Idaho. 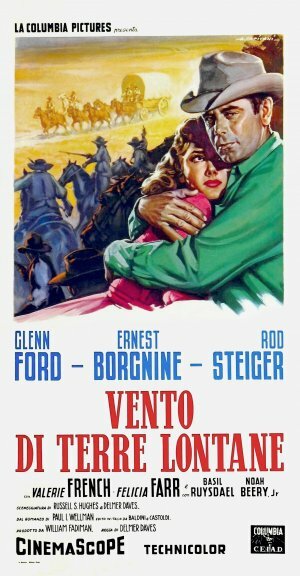 This is one of director Delmer Daves’ bigger movies, shot in color on location in Jackson Hole (like The Big Sky and Shane) and with lots of low camera angles that emphasize the sky and the magnificent Tetons. 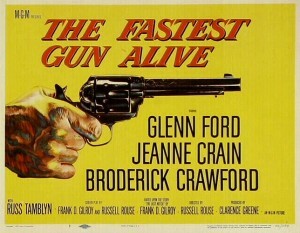 The movie is well-paced at 100 minutes. 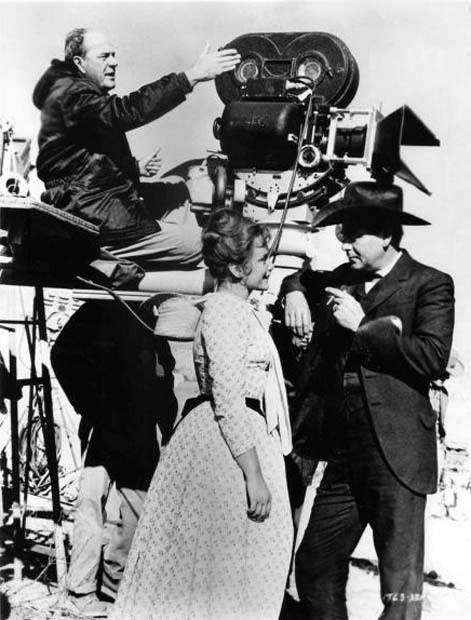 Cinematography is by Charles Lawton, Jr., who worked on many westerns (including 3:10 to Yuma and Comanche Station). The very good screenplay is by Robert S. Hughes and Daves. The music by David Raksin (Laura, Big Hand for the Little Lady, Will Penny) is also excellent. 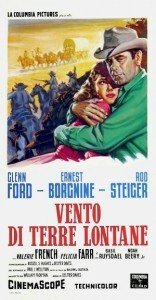 The cast is very good, especially Glenn Ford and Ernest Borgnine, whose performances are well-calibrated. Ford made the original 3:10 to Yuma with Daves the next year, and he was excellent in that, too. 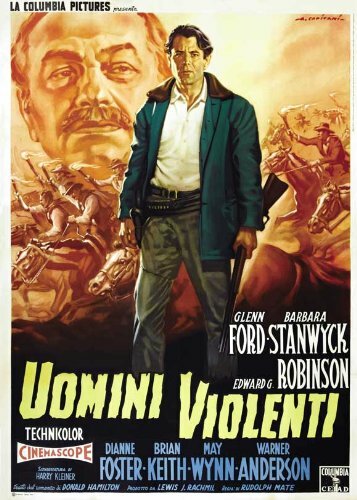 See Ernest Borgnine in bad-guy roles from the same period in Johnny Guitar and Bad Day at Black Rock, and as a semi-good guy in The Badlanders. Charles Bronson has a good-guy role, rare for the pre-Magnificent Seven stage of his career, and Jack Elam is one of the Bar 8 riders. 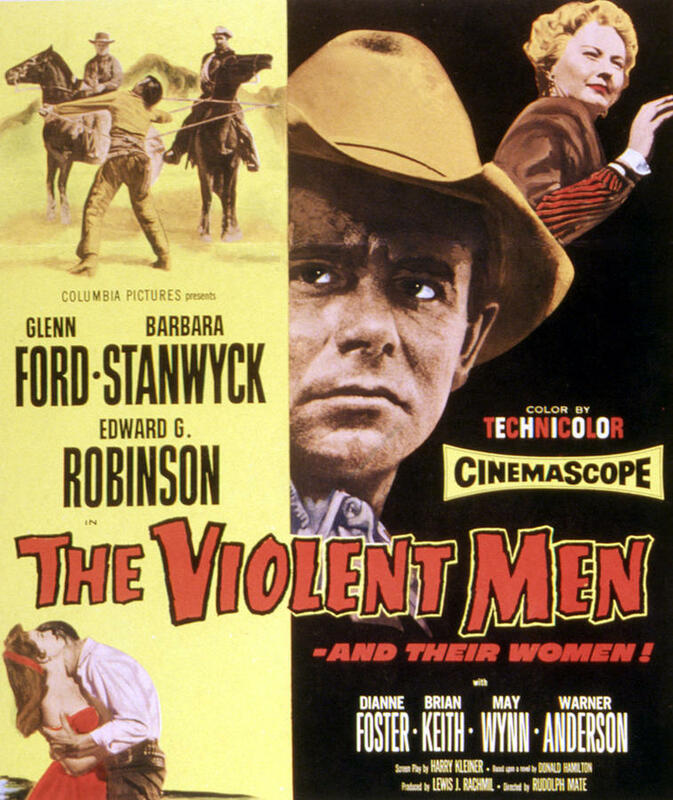 Rod Steiger is effective in another of his nasty bully roles from the 1950s. Steiger had played the title role in the 1953 telecast of Marty, and Borgnine had just won an Oscar for the same role in the movie version (1955). 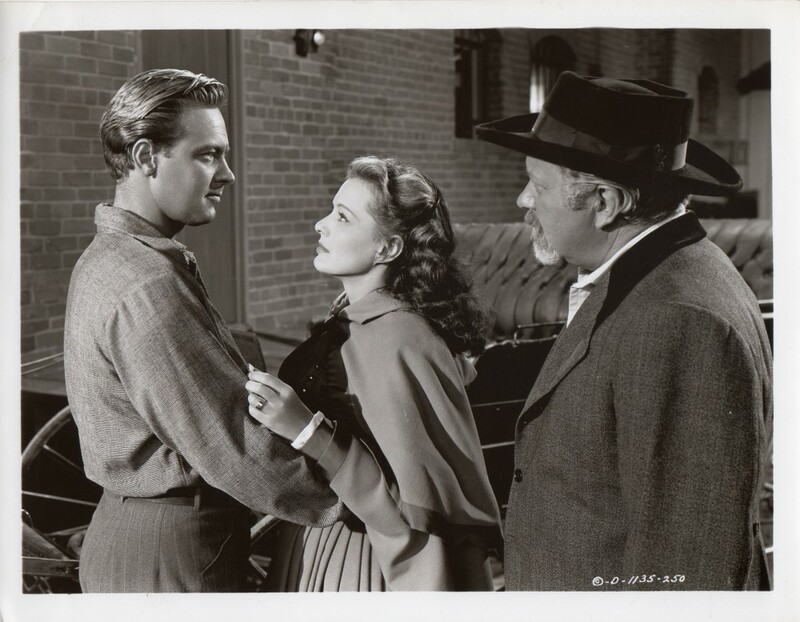 This was Felicia Farr’s movie debut, and Daves clearly liked her; she shows up again in 3:10 to Yuma and The Last Wagon. This melodramatic range saga has overtones of Shakespeare (Othello), although in this case the wife is young and faithless, and of Biblical stories (Joseph and Potiphar’s wife; and Jake is referred to as a Judas). It’s often referred to as an “adult” western because of the all the sexual tension. 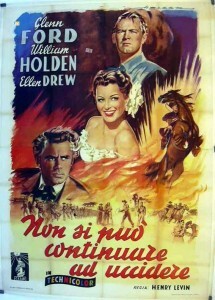 It was adapted from a novel by Paul I. Wellman. For another big melodramatic range story, see Tribute to a Bad Man from the same year, one of James Cagney’s few westerns (he was not a natural in them). But this one is better. 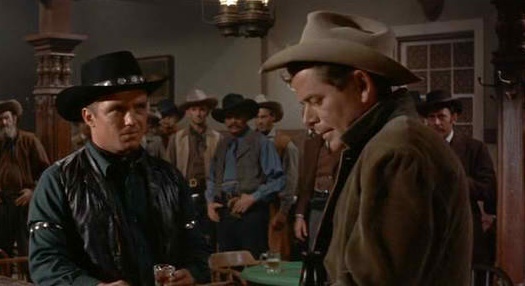 For other westerns from this stage of Daves’ career, in addition to 3:10 to Yuma, see Cowboy with Glenn Ford and The Last Wagon with Richard Widmark. 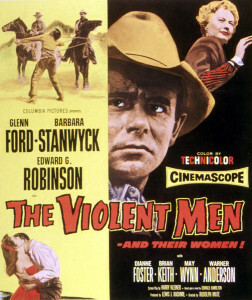 This entry was posted in Westerns Worth Watching and tagged Delmer Daves, Ernest Borgnine, Glenn Ford, Range Melodramas, Shakespearean Overtones on April 12, 2014 by Nicholas Chennault. 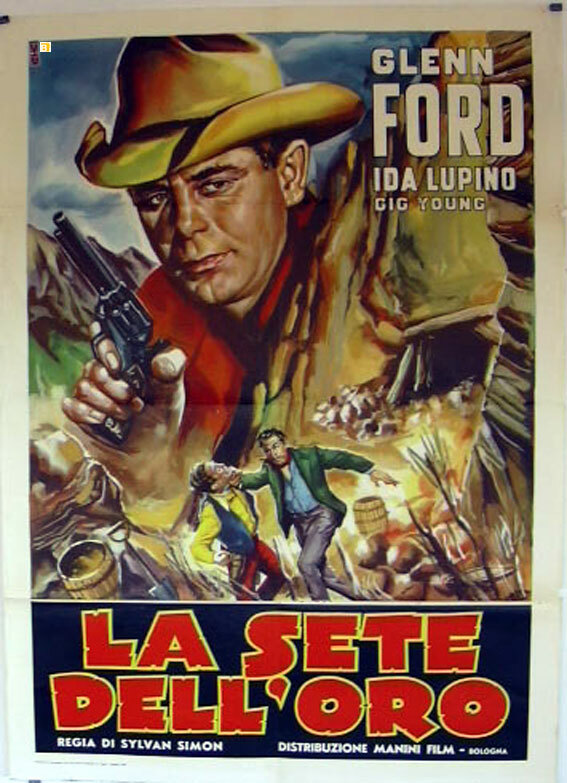 In 1943, Randolph Scott was moving to the phase of his career where he would concentrate on making westerns, when he was paired with the young Canadian actor Glenn Ford in this western set in Utah in 1863. 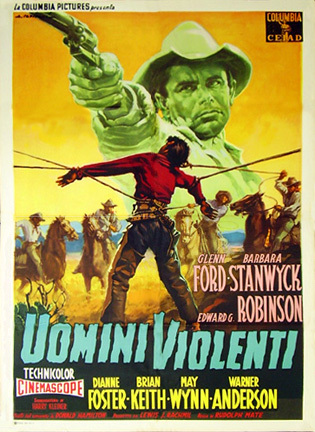 Shot in color (Columbia’s first color feature, in fact), this was a big-budget western for its time. 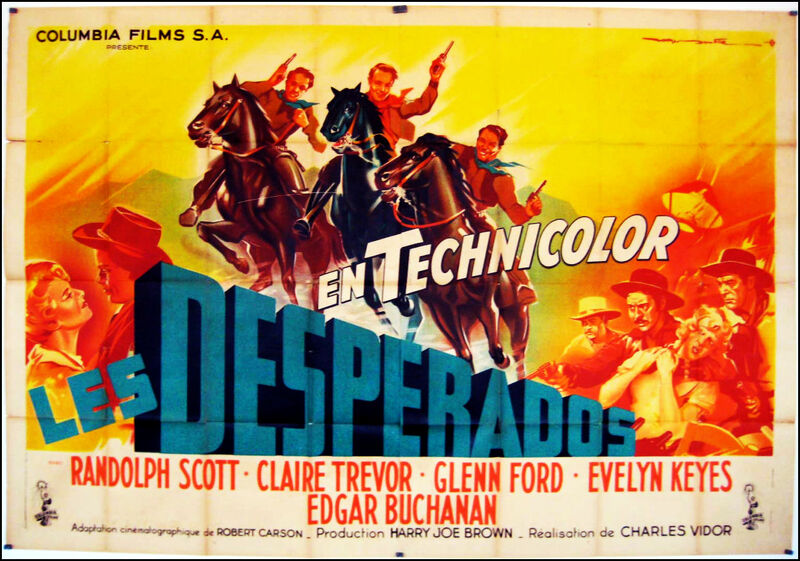 In the town of Red Valley, Utah Territory, the sheriff is Steve Upton (Randolph Scott), who might be interested in Allison McLeod (Evelyn Keyes), proprietor of the local livery stable. The local banker and several others are conspiring to have the bank robbed every time the army pays for horses, only to make off with the money themselves. Uncle Willie (Edgar Buchanan), Allison’s father, is in on it and has sent for an outlaw to do the robbing. 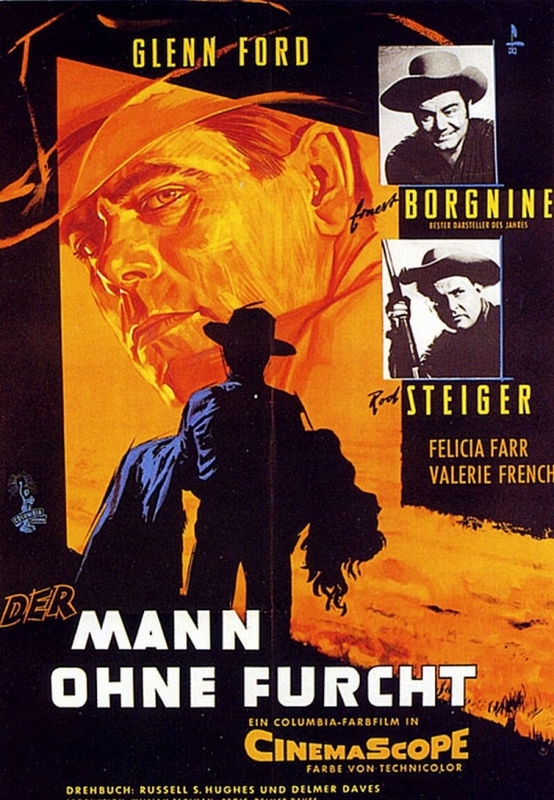 Wanted outlaw-gunman Cheyenne Rogers (Glenn Ford) and his pal Nitro Rankin (Guin Williams) show up, but he’s late and the bank has already been robbed by somebody else. 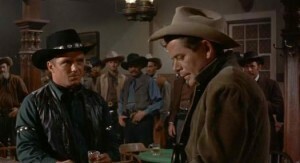 Cheyenne (Glenn Ford) steals the sheriff’s horse, without the sheriff (Randolph Scott) seeing who he is. 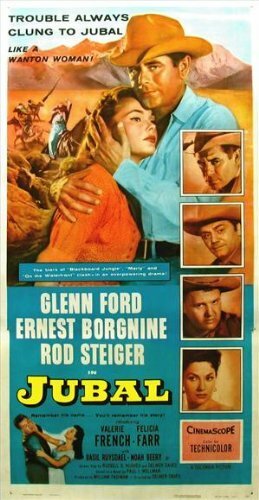 Cheyenne’s horse goes lame as he enters the valley, and he comes upon the sheriff watering his horse while out looking for the robbers. 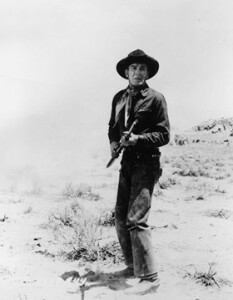 Without allowing the sheriff to turn around, Cheyenne takes his horse, leaves the lame one and heads for town. 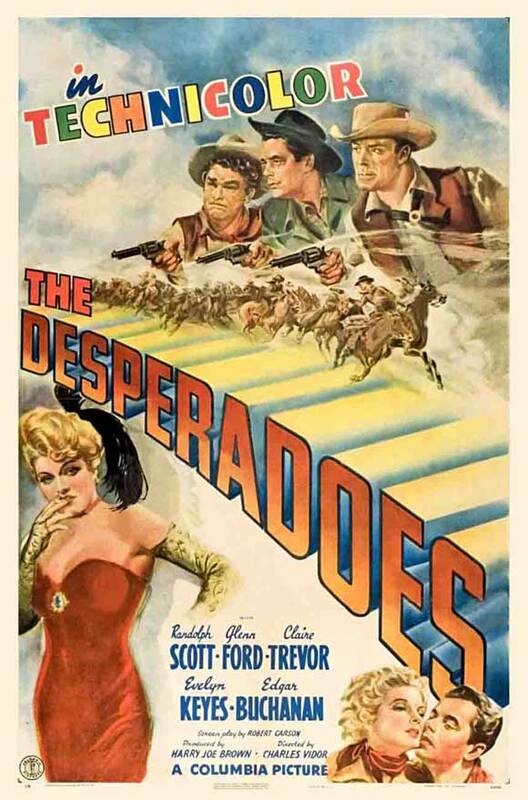 When the Steve does finally see him, it turns out they are old friends from Wyoming, along with the Countess (Claire Trevor), who runs the town’s principal gambling establishment. 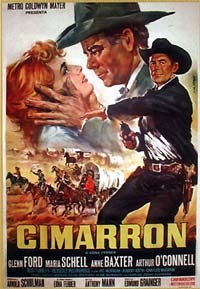 Taking the imaginative name Bill Smith, Cheyenne develops an interest in Allison himself and decides to go straight. That’s not so easy in the corrupt environment of Red Valley. Steve orders Cheyenne and Nitro out of town when local elements want to push them into a fight, and, unknown to Cheyenne, Nitro robs the bank for real on the way out. 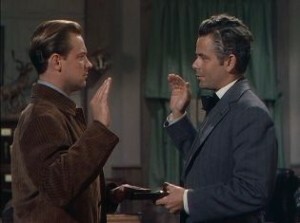 The judge insists that Steve arrest Cheyenne and Nitro for the robbery and intends to hang them. 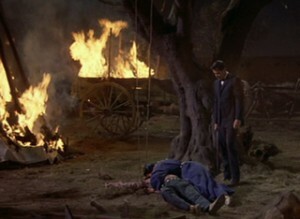 Steve thinks hanging is too severe a penalty for a robbery in which the money was returned and nobody was hurt. Cheyenne had nothing to do with it, anyway. So Steve lets them escape, only to be put in the jail himself for his efforts. 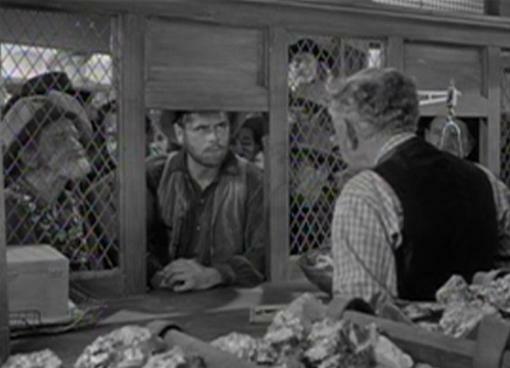 The bad guys wait for Cheyenne to return and rescue Steve; they’ll get him then and blame the previous bank robbery on him, too. 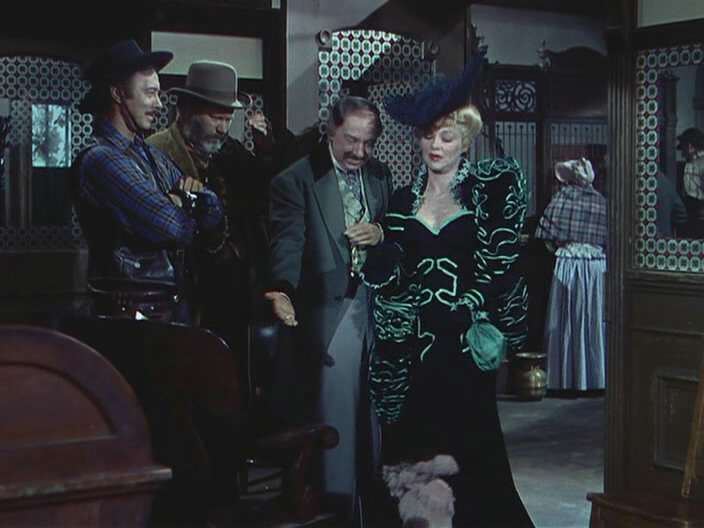 The Countess (Claire Trevor) chats up the bad guys. 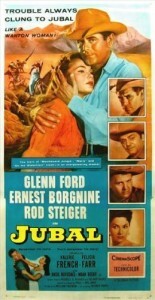 Stampeding a herd of horses as it nears town gives Cheyenne a cover to slip in and bust Steve out of jail. There is a showdown with the most belligerent of the bad guys, Allison marries Cheyenne, who presumably will be able to carry out his intention of going straight, Uncle Willie goes to jail peaceably, and Steve is able to get rid of the corrupt banker, judge (Raymond Walburn) and other elements in town. 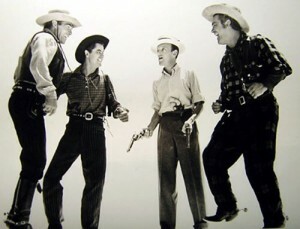 Randolph Scott, Glenn Ford and Big Boy Williams fooling around with set visitor Fred Astaire during the making of The Desperadoes. There’s a lot of action and good fights, with some comic undercurrents provided by Williams (who wears the most mismatched plaids in cinematic history) and a long-suffering bar owner (Irving Bacon) whose establishment keeps getting smashed up. The horse stampede is very well done–Randolph Scott used one again the same way in The Doolins of Oklahoma a few years later. 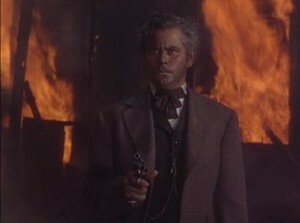 Nitro’s use of nitroglycerin is anachronistic for 1863; it wasn’t available for two or three more decades. 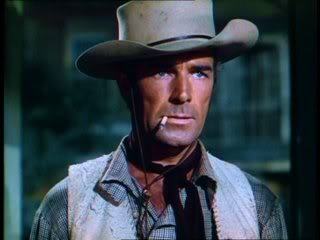 Although Randolph Scott was the bigger name in movies at the time, the concentration here is more on Ford’s character than on Scott’s. They don’t really look the same age. Director Charles Vidor, the less prominent brother of director King Vidor, was married to Evelyn Keyes, who gives a good performance as Allison. John Ford’s brother Francis Ford is one of the townsmen. 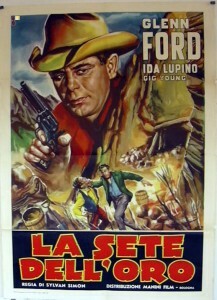 Uncle Willie is one of Edgar Buchanan’s juicier roles, too. 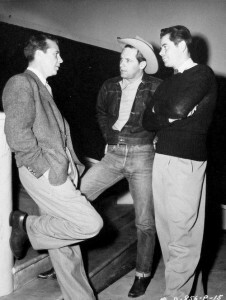 Young Budd Boetticher was an uncredited assistant to director Vidor; his own directing was still almost ten years in the future. 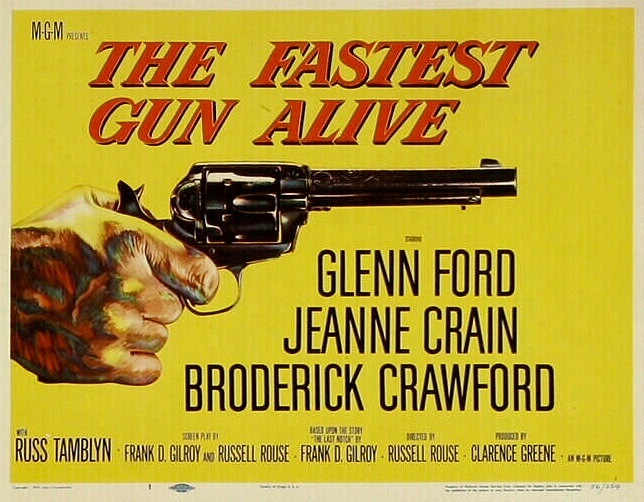 The film moves right along, at only 87 minutes. 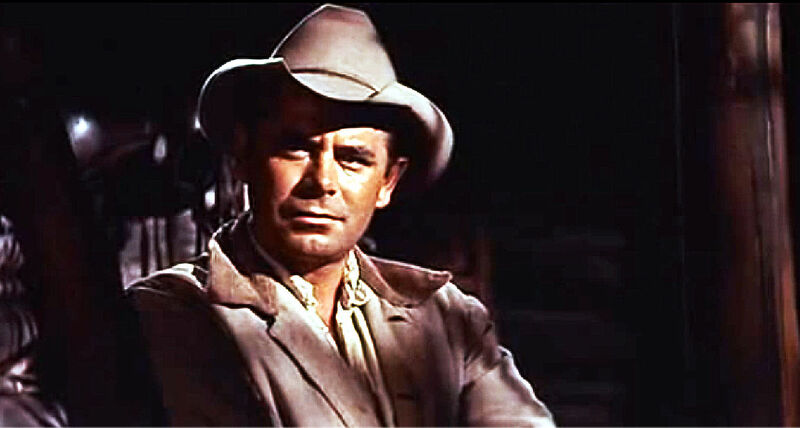 Vidor directed Glenn Ford again three years later after Ford’s return from the war in the classic film noir Gilda. By then Ford was starting to look more his age. 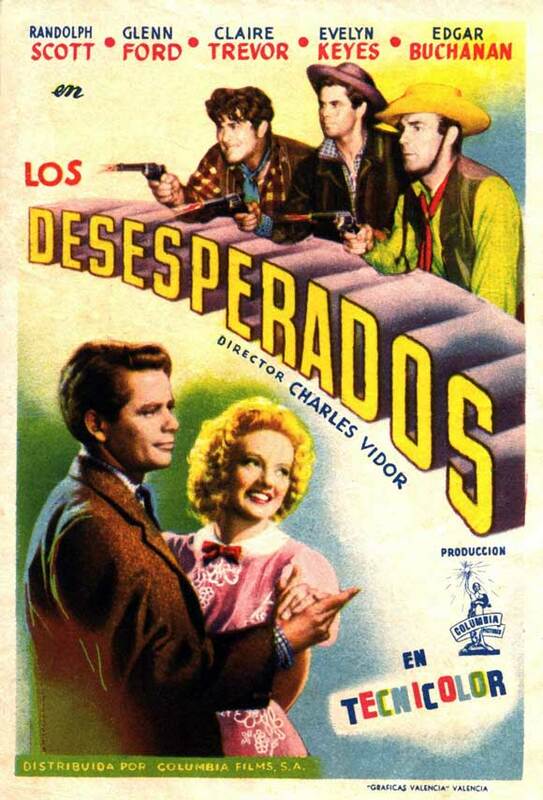 Not to be confused with 1969’s The Desperados (without the second “e”), with Jack Palance, Vince Edwards and George Maharis. Or with Ron Hansen’s excellent 1979 novel Desperadoes, about the Dalton gang. Or with Desperado, the song made famous by Linda Ronstadt in 1973. Take your desperadoes where you can find them. 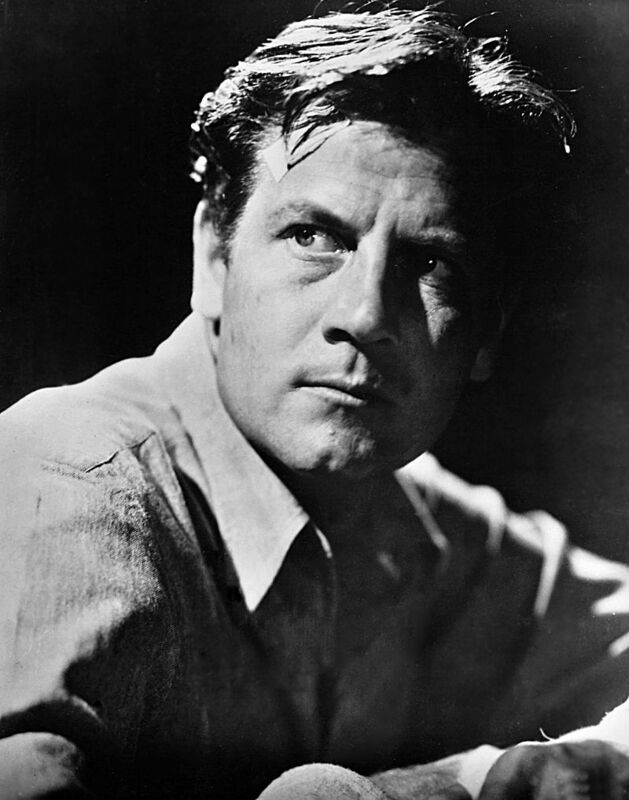 This entry was posted in Westerns Worth Watching and tagged Claire Trevor, Glenn Ford, Outlaw Gangs, Randolph Scott on March 14, 2014 by Nicholas Chennault.